Le 13ième Rouge et Or . : Le Rouge et Or l'emporte et avance à la Coupe Vanier ! Le Rouge et Or l'emporte et avance à la Coupe Vanier ! The Laval Rouge et Or rallied with two field goals in the fourth quarter to defeat the University of Western Ontario Mustangs 13-11 at Stade PEPS in Quebec City on Saturday, winning the Uteck Bowl and booking a ticket to the Vanier Cup game next weekend. 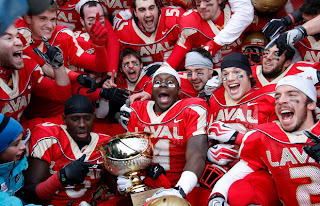 Laval will face either St. Mary's or Calgary, who faced off in the Mitchell Bowl Saturday afternoon. Christopher Milo kicked four field goals for the Rouge et Or, who didn't score a touchdown. Quarterback Ian Noble ran for a touchdown and Lirim Hajrullahu kicked a field goal to put Western ahead 11-6 in the third quarter before Laval mounted its comeback.